A business owner in Kansas was killed in an attempted robbery at his gun store, but the shop's two owners also shot and injured three of the four suspects, police said. 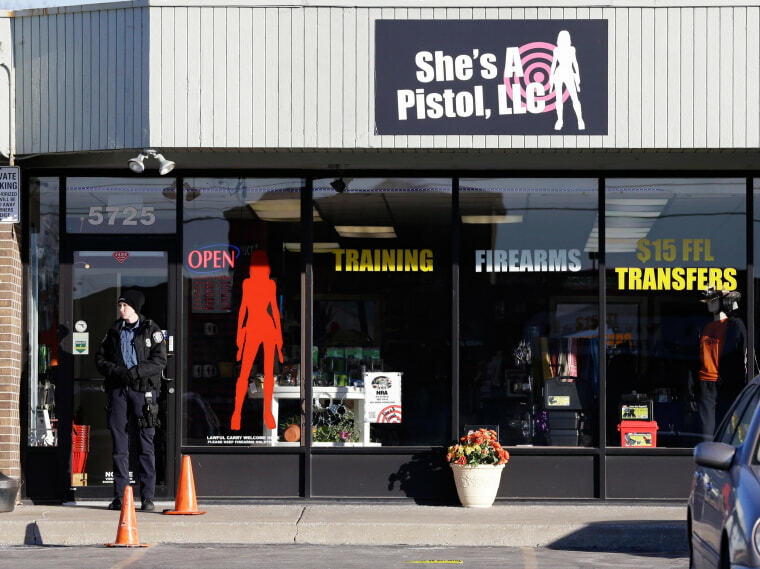 The violence in Shawnee, Kansas, southwest of Kansas City, broke out just after 2 p.m. local time when four men tried to rob She's a Pistol, a gun store and shooting range that offers self-defense courses geared toward women, according to a statement from the Shawnee Police Department. The store’s owner, John Bieker, 44, was shot and later died, the statement said. His wife, Rebecca Bieker, suffered minor injuries, according to police. The owners had fired on the suspects, but two of them fled on foot. Three of the suspects were shot, including two who were in critical condition. Police are unsure who fired first. Police found two suspects suffering from gunshot wounds in the store and caught the remaining two suspects, one of whom had also been shot, at a nearby home. All four suspects are in custody, said Shawnee Police Department Major Dan Tennis. Shawnee Mayor Jeff Meyers said the city was suffering from “great sadness.” “John and Becky are respected business owners in our community who do things the right way and are always willing to go out of their way to help others,” Meyers said in a statement.